HONG KONG, 2017-Nov-08 — /Travel PR News/ — More than HK$13 million was raised from Cathay Pacific’s Change for Good inflight fundraising programme last year through converting spare coins and notes donated by the airline’s passengers. The proceeds will go to the Hong Kong Committee for UNICEF (UNICEF HK) to support life-saving supplies and services to improve the lives of vulnerable children worldwide. 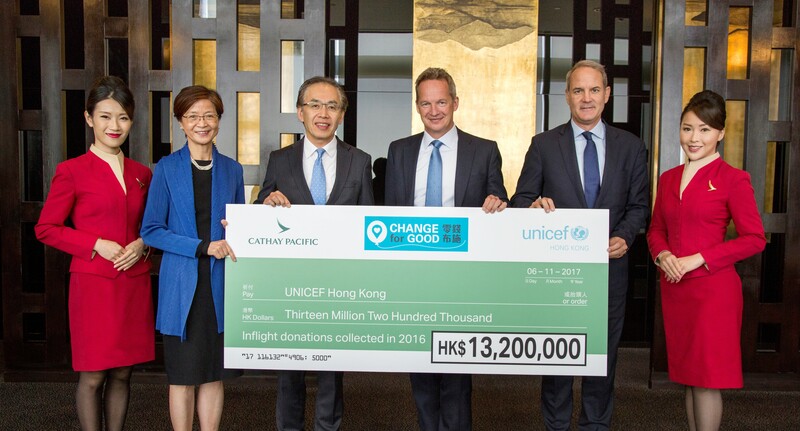 The airline presented a cheque of HK$13.2 million to UNICEF HK at Cathay Pacific City, its headquarters at Hong Kong International Airport. This entry was posted in Airlines, Flights, Society, Travel, Travel Management, Travel Services, Travelers and tagged Cathay Pacific, Change for Good inflight fundraising programme, UNICEF HK. Bookmark the permalink.